The Water Supplies Department of the Government of Hong Kong discovered 30,000 public housing units, a number of private housing units and several schools had excessive levels of lead in the drinking water when tested at the tap. Initial investigations determined the source of the lead leaching was primarily attributed to the improper use of lead solder used on the copper water pipes. Like the UK, Hong Kong has a lead cut off level of 10 micrograms per litre (ug/l). A solution to the lead problem was needed. Lead is a toxic substance that has a cumulative effect. Children are particularly vulnerable, because their brains are developing quickly and they have higher absorption rates. Multiple claims of adverse effects of lead absorption in Hong Kong children were already making their way to the authorities. 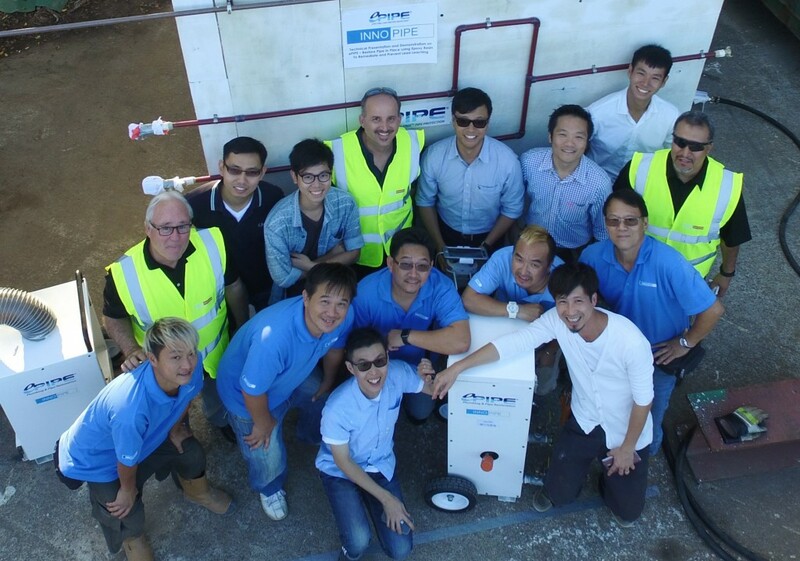 The Water Supplies Department of the Government of Hong Kong asked one of its primary water service contractors Wo Hing Construction and its subsidiary Innopipe for help. At their request, Larry Gillanders of Pipe Restoration Technologies (PRT) travelled to Hong Kong to visit several affected housing estates and make observations related to the lead contamination. A license agreement was subsequently agreed with Wo Hing Construction and Innopipe for the deployment of ePIPE in Hong Kong. Back in Los Angeles, PRT built a plumbing mock up of a typical Hong Kong unit. This helped familiarise the US team on the Hong Kong layout and provided a better insight into potential productivity. PRT shipped equipment to Hong Kong and trained a team to undertake a live demonstration on a mock-up of a typical unit that was built with the same materials that were causing the lead leaching. Pre ePIPE lead levels were tested at over 500 ug/l. Post ePIPE tests found lead levels to be in compliance with the 10 ug/l requirement. An accredited lab in Hong Kong tested twelve samples, 6 from the hot side and 6 from the cold side, independently. Pre ePIPE, lead samples were previously noted at 148 ug/l on the hot side and 507 ug/l on the cold side – well in excess of the 10 ug/l criteria. Even after 24 hours of stagnation in the system, on both the hot and cold sides, test results were similar to DWI at less than the 10 ug/l of lead cut off. ePIPE is actively working with the Hong Kong water authorities to continue to reduce the lead levels in drinking water to acceptable standards.